We resume the discussion of Warren’s economic health with a quick look at the city’s finances. This chart shows the revenue for the General Fund, from which police, fire, and street repairs must be paid, as well as almost everything else except water, waste water and sanitation. As you can see it has been a pretty steep downward slope in the wrong direction for more than 10 years. We all have our own ideas about how the city spends its money, but it is clear that whoever is in charge is forced to make new hard calls every year on what stays and what goes. The recent income tax increase was necessary just to keep municipal services where they are, which is still below the level many people would like to see. And the tax increase is only a 5 year stop gap. We will face new challenges, and probably before the tax expires in 2022. The Trump budget probably also means no more Federal dollars for tearing down vacant and derelict houses either. 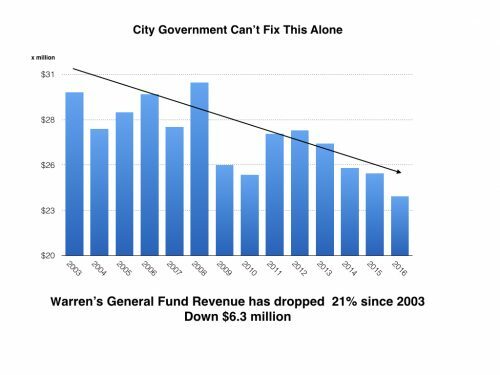 While those funds do not generally flow through the city budget they do pay for work necessary to keep Warren from falling into a deeper pit of blight. Stopping the bleeding in the city budget is a little like what Wall Streeters refer to as “catching a falling knife.” It’s not easy to do. The point is that while it is sometimes fun, and certainly a popular local sport I’m guilty of playing myself sometimes, it is a pointless exercise to ceaselessly hammer the city for it’s lack of economic development activity. Are there things they could and should be doing? Absolutely. Are they the whole solution to the problem? Certainly not. It will take the effort of the entire community to dig out of our present hole. Posted Monday, April 3rd, 2017 under Budget, Economic development.